Bankruptcy should never be considered as the easy way out of debt. If you are considering petitioning for bankruptcy, here are ten important facts about bankruptcy that you should know. If you are a UK resident, if you have a UK passport and a UK address, you can legally declare yourself bankrupt in the UK. You will be expected to pay court fees of between £400 and £500 to petition the Court for bankruptcy, although a portion of this may be waived if you are unemployed or on Income Support. The bankruptcy petition and statement of affairs documents are pretty lengthy, roughly 30 pages in total. They need to be completed fully, which can take some time. The forms need to be submitted to the court in triplicate, so rather than completing three separate sets, once you have completed your forms correctly you should make two photocopies. Once the court has received your petition forms, they have a number of options available to them, apart from approving the bankruptcy petition. They can request a ‘stay’ in proceedings, which means the court needs to gather further information before taking the petition any further. If the court feels that an Individual Voluntary Arrangement (IVA) would be more appropriate (for example if the total assets are less than £2,000) and total debts are less than £20,000), they can appoint an insolvency practitioner to arrange this. They can also issue a ‘certificate of summary administration’. This simplifies the whole bankruptcy procedure and helps to keep administration costs to a minimum. Also, a summary administration lasts a minimum of two years, compared to the standard five years for an IVA. Anyone declared bankrupt has to be careful that they do not break any laws relating to what a bankrupt individual can and cannot do. For example: bankrupts cannot form or manage a limited company or act as a company director without the court’s permission. Bankrupts cannot obtain credit of £500 or more without first disclosing their bankruptcy. It is also illegal to hold certain public offices, such as a trustee of a pension fund or a charity if you are bankrupt. Becoming bankrupt means that you are no longer in control of your assets. Your assets will be sold in order to repay your debts, apart from basic items such as food, clothing, bedding and household items. Everything else will be considered as fair game. The Official Receiver/trustee will assume responsibility over all your other assets and will be given the option of disposing with them and using the money to pay your bankruptcy expenses and your creditors. If you own your home, either with a mortgage or outright, this will be considered as asset and could be used to repay your debts, depending on how much you owe. If you have a spouse and children, you may be allowed to put off the sale of your home until you have other housing arrangements in place. If you rent your home, the Official Receiver does not have a financial interest in it and it cannot be sold to pay your creditors. However, your landlord will have to be informed of your bankruptcy and may become more stringent in expecting you to honour your tenancy agreement. The Official Receiver appointed to deal with your case is an official in the eyes of the court. They are responsible for investigating your financial affairs and make a comprehensive list of your assets. They also have to report regularly to your creditors, and give notice of your bankruptcy to all relevant parties, such as local authorities, bailiffs, utility suppliers, landlords and other creditors. Finally, the Official Receiver is responsible for deciding how long your bankruptcy will last. 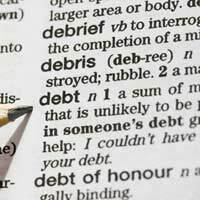 This is usually a period of twelve months but can be lengthened if the Receiver believes that the duties of the bankruptcy have not been met. The good news is that once you have been made bankrupt, you do not have to make payments to, or have direct contact with, your creditors. Creditors have to make a formal financial claim to your Official Receiver and cannot ask you directly for payment. In most cases, provided they have carried out all required duties filed under the proceedings, a bankruptcy will be ‘discharged’ after twelve months. At this point, any debts that you cannot pay will be written off. However, if the bankruptcy order makes reference to a Certificate of Summary Administration, the discharge can be made after two years. If you have not been able to carry out the duties required by the bankruptcy proceedings, the Official Receiver is entitled to apply to the court for a discharge postponement. This will mean that the bankruptcy will only be concluded once the postponement has been lifted and the duties have been fulfilled.